KAUAI (Hawaii News Now) - An aerial survey shows that the extent of flood damage in parts of Kauai is worse than previously thought. 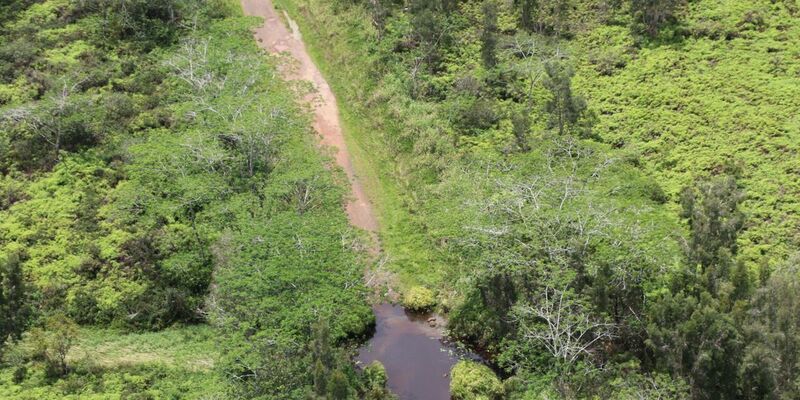 A helicopter survey of DLNR-owned lands on Kauai showed that several areas were left less affected by the historic flooding, while others were even more devastated. Sheri S. Mann, Kauai branch manager of the Division of Forestry and Wildlife, said that most DLNR lands managed to escape the worst of the flooding, and that the majority of badly eroded areas were in remote, inaccessible locations. "Some roads on the North Shore are washed-out and impassable," Mann said in a news release. "Most of the recently built bridges, including three along Camp Ten Road in the Kokee area, seem to be sound and have had no impact. The same is true of the lower-Waimea Canyon DOFAW managed lands and cabins." The assessment also found that several stream crossings in the Wailua-Kapaa part of the island were either gone or partially underwater. Several large trees were found laying across the Loop Road, prompting DOFAW to close the eastern side of the Lihue - Koloa Forest Reserve until further notice. Effective immediately, all vehicles are prohibited from traveling beyond the new Keahua bridge over the Wailua River. "What we saw surprised us on a number of levels; we didn't expect to see the specific damages where we saw them, but we also were thankful that there was very little damage to areas that often get impacted by these kinds of storms," Mann said. "Kauai has experienced tsunamis, hurricanes and floods. The land and its people are very resilient and we will recover from this," Mann said.